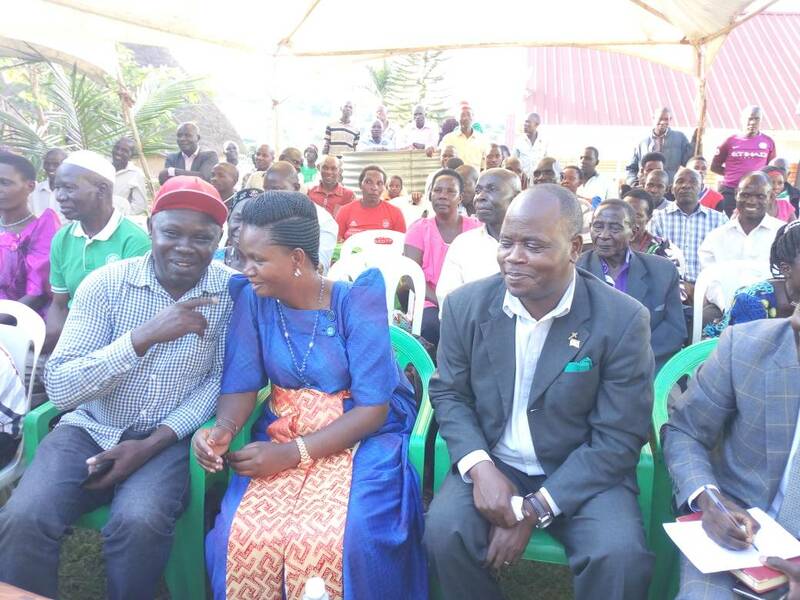 On Thursday, a Democratic Party (DP) Coalition was inaugurated, locked with a memorandum of understanding involving Uganda’s oldest party DP, and its tiny siblings; Social Democratic Party (SDP), People’s Democratic Party (PDP) and the Truth for Justice (TJ). 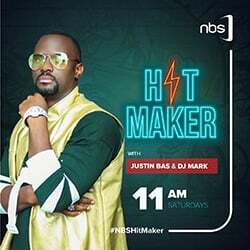 This all happened in the centre of Kampala. The group burst into songs, coated speeches and painted rosy images of themselves in power very soon. Their situation was helped with the presence of the new people magnet, Kyadondo East Legislator Robert Kyagulanyi Ssentamu alia Bobi Wine, who swept the floor with Opposition strong man, Forum for Democratic Change (FDC) party’s Dr Kizza Besigye, giving the coalition a first verbal victory. One speaker after another torched into the bright future, without the presence of five-time Presidential election winner, Yoweri Museveni or without the squabbles of the then opposition majority. This wonderful image in the future was concluded with a song- Tuliyambala Engule, a recent composition by Bobi Wine, in which he envisages a new Uganda out of the grip of President Museveni, out of the pangs of his alleged corrupt cadres, with no land disputes, joblessness, and a magical health care system. “Tuliyambala Engule, Tulivimba Mu Uganda Empya (We shall wear the victorious crown in the new Uganda)” the group chorused and ended their day. With the coalition set and rolling however, it is important to critically look at its components. Is it a true coalition that could unseat a system that has been engraved into Uganda for the last 30 or more years? Or just another form of rebranding Uganda’s oldest and toothless party? The Democratic Party (DP) was founded in 1956 by Matayo Mugwanya specifically in Buganda Region. Mugwanya handed over to Benedicto Kiwanuka, a shrewd lawyer and pure catholic in 1958. The party was founded by Catholics who objected to Protestant (Anglican) hegemony. However, DP’s success in a national election only begins and ends with Benedito Kiwanuka in 1961. The party rose to power in the 1961 elections and fell from power the following year, that was precisely it. This is mostly because of what could be called Kabaka’s curse. At the height of the 1961 elections, Kabaka Mutesa II through the Lukiiko called for a boycott of the elections, but the DP under Kiwanuka continued, sweeping 20 of the 21 seats in a very low turn out in Buganda (2% voters turned up). The DP won 23 seats elsewhere, making it 43 for the nationality and 82 for the majority, making Benedicto Kiwanuka the First Prime Minister of Uganda and the only DP flag bearer to raise to the top seat thus far. Unfortunately for Kiwanuka, he was loathed by Baganda traditionalists who claimed he had peeped into the Kabaka’s mouth by shunning the boycott and daring to place self before the mighty Kabaka and soon a downfall was plotted. The Baganda neo-traditionalists summoned efforts and formed the Kabaka Yekka (King alone) and with negotiations with Milton Obote’s Uganda Peoples Congress (UPC) formed a coalition that kicked DP to oblivion until today. Kiwanuka passed the party onto Paul Kawanga Ssemogerere, a former MP for Mengo North (1971), Minister of Labour (1979) and Parliamentary Secretary to Kiwanuka (in the 60s). Ssemogerere was the presidential candidate for DP in the generally rigged 1980 national elections where Obote’s UPC won through gerrymandering. Like that, DP lost another opportunity at the top. Ssemogerere would then accept to serve in Museveni’s NRM government after 1986 as; Minister of Internal Affairs (1986), Foreign Affairs (1988) and Public Service (1994) as well as Deputy Prime Minister. He resigned the position in June 1995, ahead of another general election in 1996, which he lost (22.3%) to Gen Museveni (75.5%), still DP was not in power. 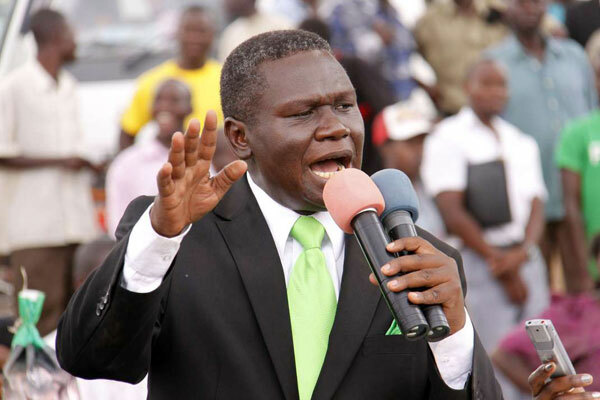 In 2001, DP did not present a candidate but rather were indirectly represented by former Old Boys; Kibirige Mayanja, Francis Bwengye and Chapa Karuhanga who altogether could not raise 2% of the vote. In 2005, Ssemogerere was replaced by former Kampala Mayor, John Ssebaana Kizito. In 2006, Ssebaana stood on the DP ticket, managing only 1.58% of the vote. He handed over to Norbert Mao in 2010. Mao tried his luck but only shot 1.86% for the DP in the 2011 Presidential elections after which he swung the party from one coalition to another, his latest being the one announced on Thursday. In conclusion, the DP since 1996, cannot raise a combined 50% to be in power even if you added all the percentages of their presidential flag bearers. Hence, they do not bring anything to the same coalition where they are the strongest. 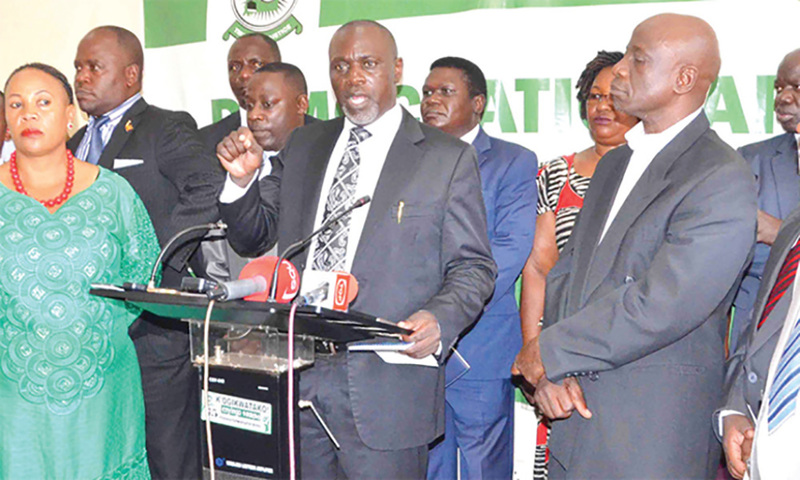 Abed Bwanika, a prominent contestant with his little known PDP is also part of this coalition. The veterinarian pastor during the 1996 elections gave full backing to president Museveni. In 2001, he switched allegiance and jumped onto Kiiza Besigye’s (FDC) trail. In the next general election (2006), Bwanika was not interested in being behind anyone, he fronted himself, this means he was tired of looking for a coalition. That same year, he garnered 0.95% of the vote (less than 1%), he again stood in 2011 and got less votes (0.65%). Bwanika again stood in 2016 and got less votes (0.90%) than his first time. The record only sets Bwanika as a depreciating political product since his best vote collection was on his first time. A total of Bwanika’s vote tally does not even make 3% for the three times. This means that whether he and his PDP are on the coalition or not, DP stays alone literally. The party was registered on Fools’ day (April 1) 2005. They have no seat in parliament and no representation at any known political cluster. What do they bring to the coalition then? Only a signature? However, The SDP was part of the coalition that fronted Amama Mbabazi. They did also offer legal advice and strictly stuck to press conferences. Lubega during a DP party meeting. He has been in and out of the party. Not yet registered as a party, Samuel Lubega’s Truth for Justice should be in the coalition to achieve relevance. Lubega himself tore off from DP and stood in the 2011 Presidential elections as an independent candidate where he obtained 32,726 votes (0.41%). He then ran back to the Democratic Party and hid in there, swaying with different splinter groups, before finally returning to the party and promising not to disappear again and now forming his own party which he has driven to the DP coalition. Lubega’s move is a confusing one just like himself. However, there is no two ways about it, Lubega is a DP member who is returning to the DP using a different door. He was not signatory to the coalition, and neither has he spoken of his interest in being part of it. The question is, will he be or not? if not, then where will he go, he has already closed the border with Forum for Democratic Change (FDC) party by touching the untouchable.